Milos Forman directs 1975s Best Picture Oscar winner that stars Jack Nicholson as a free spirited small time crook thrown into an early 1960s hospital for the insane. Nicholsons R.P. McMurphy undoubtedly thinks a little time in undergoing psychiatric assessment beats the same time in a real jail, and if not for his being a rebellious hellion it probably would have been. But he is a rebellious hellion, and it doesnt take long for him to be a thorn in the side of tough as nails Nurse Ratched (Louse Fletcher who, like Nicholson, won the Best Performance Oscar) who runs the place as if it were a prison and hides behind bureaucratese - such as running everything to a tight schedule, regardless of what the inmates - er, patients - want. The outcome is preordained, but along the way we get to watch a film that also won Oscars for Best Picture, Best Director, Best Adapted Screenplay. Not that being an Oscar-winner automatically makes a movie great. In fact, if the Academy wanted to award "Best Picture" Oscars to Milos Forman films then Amadeus and Ragtime would have been much better choices. Regardless of that, Cuckoos Nest is a film that should be seen at least once by every movie fan. Fortunately, Warner Brothers new Blu-ray release of the movie is a wonderful way to do just that - and it has enough extra stuff on it to make it a must for collectors to own. The man can craft a film, and of course it doesnt hurt to have everything else going for you including Oscar-caliber performances and words and a crew that dresses and shoots it in such a way as to create an extremely realistic atmosphere. Were meant to root for McMurphy, whos full of exuberant 1960s-style anti-establishment glee and who brings some rays of light into what would otherwise have been a very dreary environment - and which still was despite his efforts. The performances of whats basically an ensemble cast are outstanding, and feature such then-virtually unknowns as Christopher Lloyd, Brad Dourif and Danny De Vito. The Blu-ray is good, though we've seen far better picture quality on other discs. Some sections of the 1080p transfer exhibit grain, and it could almost have been shot in black and white for all the color that's allowed to infect the bland asylum. It's quite clean for the most part, though, and is definitely the best home video presentation of the movie that we've seen. Audio is only offered in Dolby Digital 5.1 Surround, with no lossless choice available. That rubs us the wrong way automatically, but to be fair this isn't a movie with a particularly compelling sound track anyway - in fact it might as well have been left in mono for all the multi-channel stuff there is. Okay, that's a bit of an overstatement, but only a bit. The disc is presented as another in Warners' series of "Book-like" Blu-rays, which means it also includes several pages of print material inside the cover. It's interesting stuff you can access while the movie's running, in case you get bored. Supplements on the disc include all of the stuff that was on the two disc DVD of a few years back, including a running commentary, this one featuring director Forman and producers Michael Douglas and Saul Zaentz. 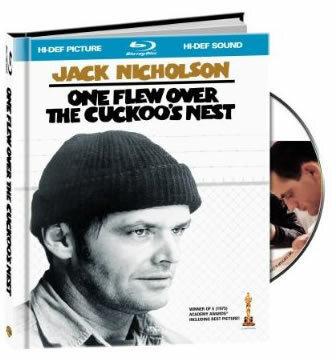 Theres also "The Making of One Flew Over the Cuckoo's Nest," a very good 48-minute documentary featuring the actors, moviemakers, and author of the original novel Ken Kesey recounting the history of the story. Clint Eastwood is Frank Horrigan, a tired veteran Secret Service Agent chasing demons from his past in Wolfgang Petersen's taut thriller. Horrigan was on duty in Dallas on November 22, 1963 when Lee Harvey Oswald shot JFK, and the experience has haunted him ever since. Then he gets a call from someone calling himself Booth, as in John Wilkes, who says he's going to kill the current president, an incumbent currently trying to make up a deficit in the polls only a few weeks before the election. This is Frank's chance to redeem himself, clear any stains on his record and his reputation, and exorcise his ghosts. Unfortunately, the would-be assassin (John Malkovich) is intent on making it a frustrating time for Horrigan as he taunts him over the phone, leaving him tantalizing tips - and crawling unwanted into Horrigan's most inner self. Frank's frustrations extend far beyond those of the assassin, however. There are some ruffled feathers - and suits - in the Secret Service who want him nowhere around, and they not only make his life miserable, they get in his way as he tries to track down the killer before he can unholster his gun. Then there's Lilly (Rene Russo), an attractive agent who proves to be as much of a distraction for Horrigan as he does for her. This is a pretty superficial look at the plot, but we don't want to give it away for those who haven't yet seen the movie. What you end up with here is a finely crafted, well told and acted thriller that keeps you going even though there are times when you figure you know exactly what's going on - and, as it turns out, you may or you may not. Eastwood turns in an excellent performance as Horrigan, a proud man but one with real human feelings and responses. Malkovich is typically evil and loopy, and the rest of the supporting cast all turn in journeyman performances. It's a thriller in the grand tradition, done with style. The Blu-ray is of first rate quality. The picture is razor sharp for the most part, with crisp and vivid images that have plenty of depth thanks to excellent black levels. The sound is just as good. Sony has given the movie a nice Dolby TrueHD 5.1 track that's clear and clean whether during scenes of quiet conversation or during riveting chase scenes. You can hear everything, and the sound field uses all the speakers well, putting you right into the action. 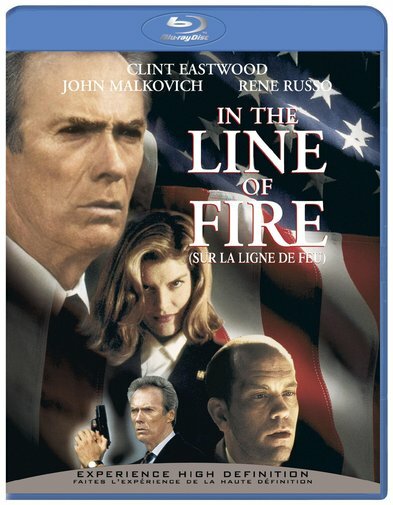 Extras include a director's commentary, deleted scenes, "the Ultimate Sacrifice: In the Line of Fire, and a behind the scenes with the Secret Service featurette. There's also a featurette from the series "How'd They Do that," another feature on "Catching the Counterfeiters." Written by Jeff Maguire, Directed by Wolfgang Petersen.